7.91 points at 23 votes (rank 98). "Steel Thunder" is a simulation of the tanks M60A3, M1A1, M3 and M48A5. Each of the three additional members of the crew of the tank can be chosen anew for each mission. All members have their peculiarities and special amenities. During the mission you can switch between driver, gunner and commander view any time (the assistant gunner is always simulated by the program) and take over the controls yourself or just give commands as commander. After a training operation you go to scenes in Cuba, Syria or Western Germany for combat operations and there you will notice quickly, that one does better not drive directly through the hostile lines, but focus on the aims from afar as well as you can, destroy them and only then proeceed further. The one who sees the other first, is the winner most of the time. In this simulation there are many keys occupied by important functions, that means that the training period is rather long, but if you do not spare this effort, will have fun for a long time (also due to the career file, which contains the reached rank, the finished missions, the exact breakdown of the shot hostile units and the list of medals of every player and is saved on disk) with this presumably best tank simulation for the C64. The game abstains from using a background story (with thanks to Accolade given the settings), but it offers four different armoured vehicles: Three battle tanks and one scout tank wait for their use on the battle ground. 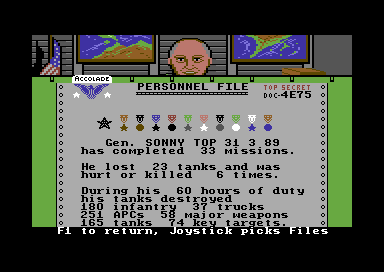 The player decides before the start of the mission, which vehicle he thinks is the most qualified for the this operation. The "Abrams" is realised in the game with the version M1A1 and represents the top class. It has the strongest armour and is powered by a gas turbine instead of a conventional combustion engine, which turns the 60t heavy vehicle into a projectile. The M1 is the tank in the game that shakes a leg fastest. As main arm it carries a 120mm smooth-bore canon, that can shoot a number of different ammunition types. In the game, the tank has a secondary arm with a coaxially MG on a caddy calibre .30 and an additional MG calibre .50. Forerunner of the M1 and long-term standard tank of the USA, in the game named "backbone of the tank force". It is powered by a 750 PS turbodiesel, which speeds the 50t heavy vehicle to about 50km/h. Its armour consists of a 105mm canon. In the game it has also a coaxial MG calibre .30 as well as a MG calibre .50. The M3 Bradley cavalry tank is a fast but only slightly armoured scout vehicle, which was developed from the armoured tracked vehicle M2 Bradley. It carries a 25mm Bushmaster machine gun with coaxial MG calibre .30 on a secondary arm. Furthermore, it owns a wheel-away launch container for wire-remote controlled tank defence missile. The M48 goes back to 1952 in its original version and had been in service for about 35 years when the game was released, thanks to various measures to raise the combat power. The production of the version A5 started in 1975 and it carries the same 105mm canon as the M60A3. Although it carried only the MG calibre .30 in reality, the game designers treated it also the oligatory MG calibre .50. The tank is a bit slower than the M60 and has less armour, furthermore it has no weapon stabilisation asset as the other vehicles in the game. If anybody finds out how and why this museum piece has made it into the game - let us know. 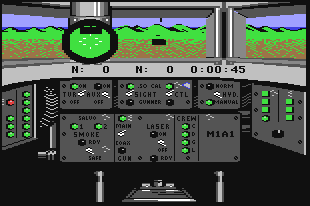 "Steel Thunder" offers the player several different fireworks, which you can use to fulfill each mission: The tanks have - same as in reality - different types of ammunition. The target decides the choice of weapons. Against infantry you need to use MG and APERS grenades whereas against tanks you need HEAT or APDFS missiles. The M3 also has wire-guided tank defensive missiles that are equipped with a HEAT warhead and whose trajectory can be corrected by the gunner after shooting it. TOW ATGM (Tube Launched Optically Tracked Wire Anti-Tank Guided Missile) Wire guided missile system, which carries a hollow charge warhead. APFDS (Armor Piercing Fin-Stabilized Discarding Sabot) A low-calibre, wing-stabilized armour penetrator that works with kinetic energy. HEAT (High Explosive Anti-Tank) The projectile carries a metal cone that is accelerated by explosive devices. Breaks through its aim at the impact. HEP (High Explosive Plastic) also HESH (High Explosive Squash Head) Deforms profusely at the impact onto the aim and leads to an extensive effect of pressure. If the armour is not broken through, then splints can come off from the other side and endanger the crew. APERS (Anti-Personnel) projectile contains aluminium needles with the length of 2-3", that work on soft targets. .50cal MG Probably hard-core ammunition in the game. .30cal MG Probably ordinary full metal jacket in the game. To know, what type of ammunition is effective against which aims, look at the following table. The information was taken from the manual. First there is the copy protection query. Use the joystick to move the pencil to the correct answer and press the fire button. For this you have 45 seconds. Enter your name and press "Return"
If this is your first "Steel Thunder" mission you will be allocated to the Cuba front. Press the fire button to add your name to the list. The general presents you the choice of missions. 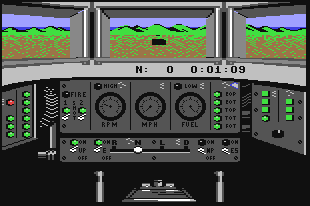 Press the fire button to choose the mission (if you want to view the map, press "F3", for tank specifications "F7", the key "F5" to leave these screens). Press the fire button to choose the M1A1 Abrams Tank. Now choose the ammunition. For your first game, just press the fire button 3x to choose the standard. Every tank possesses 3 option screens for ammunition and additional armour. After the General appears again, press the fire button to start the simulation. Now your tank is ready for the battle. Press the key "9" to view the map. The tank icon represents your current position, in this case the HQ. The primary aim is encircled. The red and the blue "X" show the two waypoints that you can use to set your course towards the target. Move the joystick to position the blue "X". The path between the HQ and the blue "X" is the first part of the route. Press the fire button. Now you can place the red "X" with the joystick. The section between the blue and the red "X" is the second part of your route. Starting from the red "X", your tank driver will try to drive to the target. The waypoints can be changed any time during the journey. When you have set your course, press the key "4" to change to the tank driver. Draw the joystick up to move the tank and to raise the speed. If you are not in the commander station press the key "6". Bring the target into the visor of the canon and press "Return" to identify it. Pay heed that the correct ammunition is loaded, if not change it with the key "F7". Press the key "." (dot) to switch to 10x magnification. This makes aiming a bit easier. Press the space key and your gunner will shoot at the enemy. If you press the space key once again he will stop shooting. Press the key "5" to change to the gunner. Bring the target into the visor with the 3x setting and press "Return" to identify it. Load the correct ammunition with the help of the "F7" key. Set the turret rotation to slow with the key "Right Shift" to be able to aim more precisely. If a square is shown at the lower left in the target display, the grenade is loaded and ready. Press the fire button to shoot it. If the target moves, aim a bit in front of its current position. Bring the target into the visor and press the "." (dot) to switch to 12x magnification. Centre the target in the crosslines and press the fire key to shoot a missile. Use the joystick to keep the target in the crosslines until the TOW-2 reaches it. After the target has been destroyed, press the key "C" to lower the missile launcher again. Hint: TOW missiles must be fired from a standing position! Press the key "£". With this you instruct the driver to go backwards. Shoot at arriving vehicles. As you have the TTS switched on you can see them, but they cannot see you! No mission, with this you only save and end the game. Destroy a hostile mortar post. This is a practical mission in which you cannot get harmed. Take a M3 Bradley which is ammunitioned with HE 25mm to provide this position and its crew. But beware, this is a real rats nest. Their 120mm mortars can be dangerous. Expected promotion to the rank "Sergeant". Stop an infantry unit, which are on recon-mission behind the lines. These are supported by some BTR-70. Take an M3 Bradley which is ammunitioned with AP 25mm, to tidy up. But don't lose much time. Always drive defensively with a tank. A grenade needs only 2-3 seconds to reach its aim, so that a tank that moves steadily over open battlefields is an easy prey. When meeting relatively harmless vehicles such as the BTR-70, use the .50cal machine gun before you waste grenades for the main canon. They also can destroy not-armoured or slightly armoured vehicles quickly. As theses vehicles do not have enough firepower to be a serious threat, you can get close enough to them. No matter how good the evaluation of your gunner might be, his abilities are limited. You can trust him during your first missions until have have made yourself comfortable with your tank, but in later missions you should control the main canon yourself. To disarm a T-80 in a distance of 3500 yards is beyond your gunner in any case. You can support your gunner, after having given him the order to fire, by using the 3× scope of the commander to scan new targets while he is shooting. While driving scan the horizon with the 3× setting. Usually you will see the enemies before they see you. If you have sighted a target, wait until your gunner has identified it positively (there is nothing worse than blowing up your own units). Then choose your weapon type and switch to 10× view, as the 3× scope is not as precisely aligned as the 10× scope. Your canon normally has a bigger reach than the one of your enemy, use this advantage. You will notice that the time passes faster in this simulation, if you are far away from hostile vehicles. This is intended to be so, the program compresses the time factor while you drive through unmanned areas and instantly restores the normal state as soon as hostile units appear. Your tank is big, well-armoured and carries tons of firepower, but nevertheless it is not a good idea to drive into the middle of a group of hostile units. Always operate from the distance and be prepared that you have to fog your tank fast, switch to thermal image and give your driver the command to go backwards. If the target moves, do not aim on its current position but a bit in front of it. If the situations allows it, you can instruct your driver to drive a bit closer ("+" key) to strike more easily. Another possibility is to instruct him to drive a straight line ("0" key). But with this it is also easier for your enemy to hit your own tank! Not every grenade that hits a target does also destroy it! If a grenade strikes a target at the corner it is possible that it gets deflected by the armour. Also every type of grenade is only most effective at a certain firing distance. Certain tanks are more unerring than others: The M48A5 has a hit rate of 62% at 2500 Yards, while a M1A1 has 97% at 3000 Yards. To raise your hit rate, make sure that you measure the distance to the target before every shot and always use the 10× scope. The canon stabilisation system can neutralize some of the movements, but there is a limit. It can only move the cannon within its own moving limits, and when a target is sighted at the horizon and your tank drives full tilt over a crest, it will not be able to keep the target in sight and is even a danger for the assistant gunner who is exposed to the "kickout" of the canon. Use your machine gun in short blows. This protects it from overheat and gives you the possibility to see if you have hit. Additionally you save ammunition. You can find FAQs here. With activated Engine Smoke one is practically invulnerable while standing. If your drive too fast, the smoke swirls and one can get hit again. You can avoid this by only driving backwards. Even with full speed backwards you stay protected. The tank now needs more fuel, but one can directly steer towards the target without having to consider hostile posts. When you arrive at the target the only difficulty is to find the targets by the muzzle flashs in the fog. General Bamse: "For me THE military career simulation. Driving with the M3 Bradley over the map, avoiding contact to the enemy until you reach the primary target, then on the way back killing as many enemies as possible until the TOW missiles are empty. The game does not have many sound effects, but the ones that are there are coherent and bring out the realistic realization. The same can be said for the not spectacular, but functional graphics and the nice rocking effect while driving. With the scenarios and the medal / promotion the game offers enough incentive to keep oneself busy with it. Although the TOW missiles are a bit too powerful (every enemy is destroyed from the fartest distance (= one pixel in the augmentation) with a single shot) the game gets full points from me!" Ragnarok: "An unbelievably complex and realistic simulation for C64 games, that has been researched meticulously and can easily stand comparison to the port in the PC. The graphics are detailled, the sound atmospheric and the gameplay is easy and comfortable despite the big number of keyboard commands. The choice of the scenarios corresponds to the spirit of the time, same with the presentation as unreflected wargame with a great portion of "hooray-patriotism". If you overlook this point, then Steel Thunder is a solid tank simulation with diversified missions, whose depth fascinates still today. A top title, full points! And now I am busy, there is an armoured supply convoi behind the hostile lines that cries to be annihilated..."
H.T.W: "Rattle there, shoot the target and go... this is the way everybody imagines it to be, if he has never driven such a vehicle himself. But this is not the way and that is shown by this simulation!! Such a tank is rather complex in its technics, needs some training period for its controls and is also very prone to damage at certain points, as e.g. the chains. It is no fun to stand inside your steel box in the middle of the hostile emplacement, a chain has been thrown down and one cannot move any more. The planning of the route is crucial for survival and the single members of the crew need to work perfectly as a team. Concerning the simulation itself and its presentation I can only agree to my previous speakers, although Gunship seems to me yet more sophisticated and closer to reality, as there is no possibility to return to HQ by pressing a button, but one has to fly back again by himself after fulfilling the mission. However: very good!" This page was last modified on 6 March 2016, at 07:41.